A young MesopotamiA student is poised to continue achieving the academic excellence he has begun at his Alma Mater. Casroyâs record at the St. Josephâs Convent Marriaqua so impacted on Ambassador Elizabeth Chu that the scholarship was offered following graduation exercises held at the school last Thursday. That the young man was adjudged Student of the Year from among the 2004 graduating class tells only part of the story. When the list of awardees was being called, Casroy had to return to the podium repeatedly as he received award after award for the following areas of endeavour: Chemistry, Biology, Agricultural Science (Double Award), Visual Arts, Physics, Information Technology and Rugby. But, as if those were not enough, he was also adjudged Most Disciplined Student and accepted the prize for Application to Duties. In his valedictory speech, he recalled his challenging road travelled as a student who did not write Common Entrance but who entered secondary school after writing the School Leaving Exams. He amused the capacity packed auditorium of parents, teachers and graduands as he recalled his journey from being a timid lad with low self-esteem to one who learnt to grow and excel among his peers. He was full of praises for Sister Pat, the school principal, who was described as a person who exhibited many traits that baffled students even as she lovingly and sternly guided their academic careers. 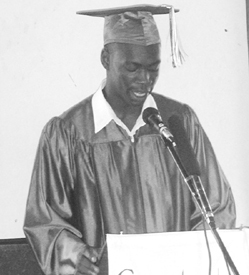 Casroy persevered through it all and in the end has been described by his school as the student who best exemplifies the ideals of the school. He said he intends to study Technology following his first year in Taiwan learning the Chinese language.